Have you been on a vacation where people stop to applaud the sunsets? What about swimming with the dolphins? Or going horseback riding in the jungle? Or would you rather just relax under a palapa on the famous Los Muertos Beach? 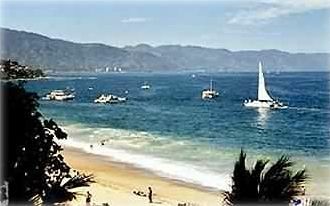 Puerto Vallarta is the perfect destination for your next vacation and our condo is your perfect home away from home. We've chosen colors of the ocean's blue and the sun's yellow blending touches of nature's green accented with the flavor of colonial Mexico for the perfect color theme to accommodate the gorgeous views. Our spacious condo accommodates four to six people with two bedrooms, two full baths, and couches designed to use as single beds. The fully-equipped, American-style kitchen offers a beautiful view of the mountains. The formal dining room flows in the living room which opens onto the large ocean front terrace that is also accessible from the master bedroom. Picture yourself on the terrace overlooking the beach experiencing the breathtaking views. May your time be filled with relaxing sunsets, cool drinks and sand between your toes. Three (3) TV's in condo. Full balcony facing directly to the ocean.